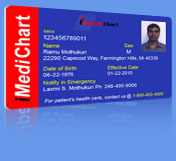 The patient is in a medical emergency and we need to access his/her medical records. Patient can not remember his/her PIN or is in a condition where he/she can not provide that information to us. I have read the iMediChart.com Terms and Conditions and agree to be bound by them. PIN: The patient is in a medical emergency and we have been authorised by the patient to access his/her medical records. Patient willingly provided us his/her PIN. I have read the iMediChart.com Terms and Conditions and agree to be bound by them.